Nothing better than an easy, chilled side dish that can be made in advance, mostly, and savored for days later. Try to cut all the ingredients to the size of corn kernels so that no one flavor out powers another in each bite. In the bottom of a large bowl, combine vinegar, olive oil, salt and pepper. Add the rest of the ingredients and toss together. 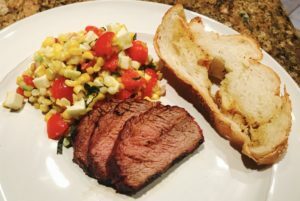 Serve with grilled steak or chicken. Alternative preparation: In place of vinegar use lime juice and in place of basil, use cilantro for a Latin spin. You can also add black beans and bell peppers! Get ready to have a ball with Team Phenoms!